Place a 10 inch skillet or very carfullty the flanera pan at medium high heat. Add the sugar and melt it until it becomes caramel or until the color turns deep golden brown. Make sure, carefully, to cover the walls and the bottom, the sugar will be dissolved and very hot, of the flanera well, and then let it cool. Place in a blender the eggs, milk, pumpkin puree, condensed milk and vanilla and blend on high speed until it is well and smooth. Pour the flan preparation into the baking pan and cook for 1 hour, using a water bath either on the stove over a low flame, or in the oven at 400°F. Let the flan cool while sitting in the water bath and then refrigerate until ready to serve. For serving take the flan out of the mold and plate. Decorate with pumpkin slices, cinnamon sticks, “pepitas”, pumpkin seeds and sprinkle ground cinnamon on it to taste. A blender, a flanera, a deep pot (for stove-top method), or an oven proof glass dish or deep baking sheet (for the oven method) are necessary for this recipe. Flan is a delicate dessert, and for that reason it must be cooked in a water bath (baño María or baigne Marie) at a low temperature. This is very important in order to get the desired consistency, as well as to avoid a rubbery taste or cracks in the dessert. You can use a water bath either on the stove or in the oven. For this specific recipe I used a water bath in the oven at 400°F. A water bath is a deep pan or pot with water into which a smaller pot with the food to be cooked is placed. In this case, the flanera is placed into the bigger pot or pat with the water. Do not allow the water to spill into the flan mixture. The hot water provides a constant and steady heat source ensuring slow and even cooking. It is the preferred procedure for cooking flan. This flan recipe is a good replacement to a traditional pumpkin pie. Flan is a Latino tradition and a delicious dessert that is easy to prepare and almost everyone falls in love with it after the first bite. The basic recipe used for preparing a vanilla flan allows for a lot of flexibility. That makes it easy for you to get creative by changing flavors by using different ingredients. You can also adapt your flans to complement each season of the year! 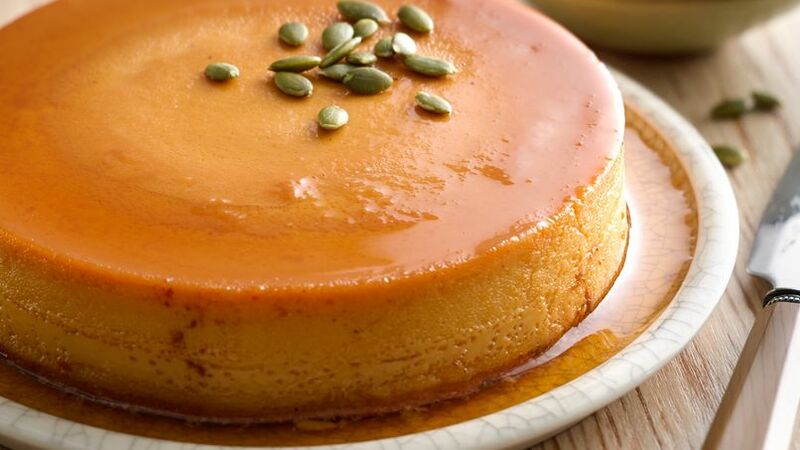 That is why today I’m sharing with you my recipe for Pumpkin Flan. Make it and celebrate the fall and the Thanksgivings holidays with style! Let’s cook!